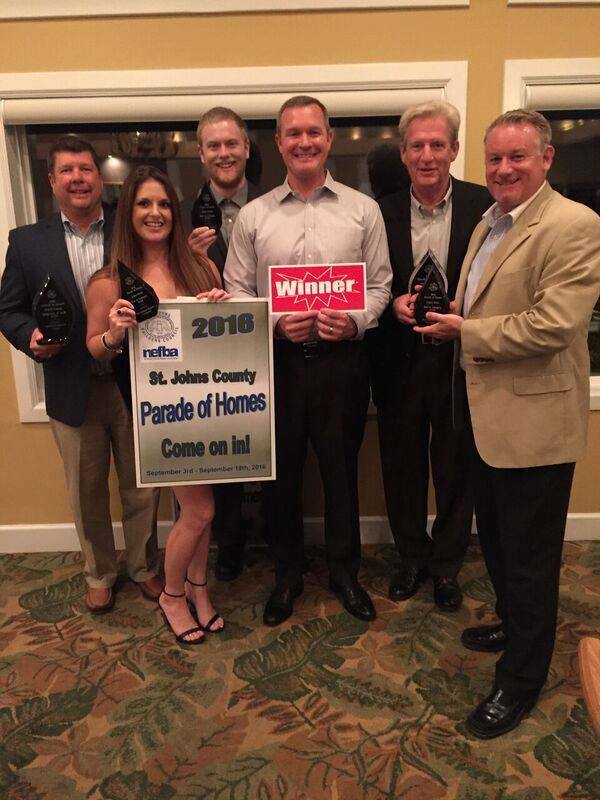 Jacksonville homebuilder Providence Homes received five awards at the St. Johns County Parade of Homes award banquet held September 6th at Marsh Creek Country Club. The Parade of Homes and the awards were hosted by The St. Johns Builders Council & NEFBA. The Hendry model located in Markland in St. Augustine won Gold. The Hendry, 138 Bronson Parkway, features four bedrooms, three baths, with an optional bonus room and full bath, plus a 1st floor game room and oversized covered patio. This 3,486 sq. ft. home includes an open concept kitchen, family and dining space with easy access to the covered patio. Several Providence homes at Nocatee in Ponte Vedra were also recognized. In Twenty Mile Village, The Adair - Village Park model located at 104 Jackrabbit Trail received a Gold award. The Adair features 1,468 sq. ft. of living space, with two bedrooms, two baths, a family room, café, office, covered front porch and 2-car garage. A Carriage House option is also available, the perfect spot for extended stay guests or a teen suite! The Bryant model at Addison Park won a Silver award. This lovely home, located at 65 Morningstar Way, is 1,876 sq. ft. of family-friendly space! The Bryant has three bedrooms, two baths, a living room, dining room, family room, covered front & side porches, and a 2-car garage. The open floorplan lends itself to easy conversation with family and friends. And in Twenty Mile Village Grove, The Madison model located at 605 Eagle Rock Drive received Silver as well. A spacious two-story home, The Madison has four bedrooms, 3.5 baths, and 3,426 sq. ft. of living space. This home features a study, dining room, family room, gourmet kitchen/café, butler’s pantry, private family loft, covered patio and 3-car garage. The St. Johns Builders Council is part of the Northeast Florida Builders Association, representing the Builder and Associate members, in the Building Industry, in St. Johns County. The Northeast Florida Builders Association (NEFBA) is a not-for-profit trade association representing members of the community who earn their livelihood from the housing and construction industries.